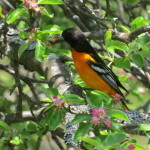 The Baltimore Oriole stands out among the tree canopy in his flaming orange and black feathers. Interestingly, the Oriole is a picky eater, preferring the darkest of fruits. In fact he will pass over green grapes even if they are ripe. He is a common visitor to bird-feeders so look for him near our feeder in the bird and butterfly garden on the main field.